Theodore Ernest Els (/ˈɛls/; born 17 October 1969) is a South African professional golfer. A former World No. 1, he is known as "The Big Easy" due to his imposing physical stature (he stands 6 ft 3 in (1.91 m)) along with his fluid golf swing. Among his 71 career victories are four major championships: the U.S. Open in 1994 at Oakmont and in 1997 at Congressional, and The Open Championship in 2002 at Muirfield and in 2012 at Royal Lytham & St Annes. He is one of six golfers to twice win both the U.S. Open and The Open Championship. Other highlights in Els' career include topping the 2003 and 2004 European Tour Order of Merit (money list), and winning the World Match Play Championship a record seven times. He was the leading career money winner on the European Tour until overtaken by Lee Westwood in 2011, and was the first member of the tour to earn over €25,000,000 from European Tour events. He has held the number one spot in the Official World Golf Ranking and until 2013 held the record for weeks ranked in the top ten with 788. Els rose to fifteenth in the world rankings after winning the 2012 Open Championship. He was elected to the World Golf Hall of Fame in 2010, on his first time on the ballot, and was inducted in May 2011. When not playing, Els has a golf course design business, a charitable foundation which supports golf among underprivileged youth in South Africa, and a highly regarded winemaking business. He has written a popular golf instructional column in Golf Digest magazine for several years. Growing up in Lambton, Germiston, South Africa, he played rugby, cricket, tennis and, starting at age 8, golf. He was a skilled junior tennis player and won the Eastern Transvaal Junior Championships at age 13. Els first learned the game of golf from his father Neels, a trucking executive, at the Germiston Golf course, He was soon playing better than his father (and his older brother, Dirk), and by the age of 14 he was a scratch handicap. It was around this time that he decided to focus exclusively on golf. Els has often been compared to Greg Norman in the sense that both men’s careers could be looked back on and think what could have been. Although the two of them are multiple major championship winners, both share disappointment in majors. Their disappointments have ranged from nerves, bad luck, and being outplayed. 1996 was the year where Norman collapsed in the Masters, whereas the year before Els did in the PGA Championship. Nearly four years later, Els finished runner-up in the 2000 Masters Tournament, and again in 2004, losing in a heartbreaking defeat to Phil Mickelson. Els has finished runner-up in six majors, finishing runner-up to Tiger Woods more than any other golfer, and has often been described as having the right game to finally be the golfer to beat Woods in a major. Unlike most of his contemporaries, Els is known for his willingness to participate in tournaments all around the world, having played regularly in European Tour-sanctioned events in Asia, Australasia and his native country of South Africa. He says that his globe-trotting schedule is in recognition of the global nature of golf. This has caused some friction with the PGA Tour, an organisation that would prefer Els to play more tournaments in the United States. In late 2004, Tim Finchem, the director of the PGA Tour, wrote quite a firm letter to Els asking him to do so but Els publicized and rejected this request. The PGA Tour's attitude caused considerable offense in the golfing world outside of North America. Since his son's autism diagnosis, Els and his wife have been active in charities devoted to that condition. This involvement has increased as Ben has reached school age. In 2009, Els launched an annual charity golf event, the Els for Autism Pro-Am, held at the PGA National Resort & Spa in Palm Beach Gardens near his South Florida residence during the PGA Tour's March swing into the area. The first event, which featured many PGA Tour and Champions Tour golfers, raised $725,000 for The Renaissance Learning Center, a nonprofit charter school in the area for autistic children. The couple has also established the Els Center of Excellence, which began as a drive to build a new campus for the aforementioned school in Jupiter, Florida, but has since expanded into a $30 million plan to combine the school with a research facility. 3 Els's victories in the majors and WGC events count as wins on both the PGA Tour and the European Tour. ^ "PGA Tour Media Guide – Ernie Els". PGA Tour. Retrieved 23 December 2013. ^ "Week 11 – Ernie Els Wins WGC-CA Championship To Jump To World Number Eight While The Puerto Rico Open Goes to a Monday Finish". Official World Golf Ranking. 15 March 2010. Archived from the original on 23 February 2012. Retrieved 23 July 2012. ^ "2011 Hall of Fame class: Els, Ford, Bush, Hutchison". PGA Tour. 22 September 2010. Retrieved 23 December 2013. ^ "Ernie Els speaks out over son's autism". The Daily Telegraph. 11 March 2008. ^ "PGA, Els Family Tee Up to Raise Awareness". Autism Speaks, e-Speaks. 2 May 2008. Retrieved 23 July 2012. ^ Dorman, Larry (21 June 1994). "Forget Finesse, Remember a Name: Els Wins Open". The New York Times. Retrieved 22 July 2012. ^ Kelley, Brent. "Volvo World Match Play Championship". About.com. Retrieved 23 December 2013. ^ "Els has 3-year plan to catch Woods as world's No. 1". Sports Illustrated/CNN. Reuters. 20 December 2006. Retrieved 23 December 2013. ^ "Els gets first win in two years". ESPN. Associated Press. 14 March 2010. Retrieved 20 March 2010. ^ "Ernie Els completes Arnold Palmer Invitational victory". BBC Sport. 29 March 2010. Archived from the original on 1 April 2010. Retrieved 29 March 2010. ^ Dunham, Chris (26 February 2013). "FedExCup Spotlight: Ernie Els". PGA Tour. ^ Dorman, Larry (20 June 2010). "With Nerves in Check, Graeme McDowell Wins U.S. Open". The New York Times. ^ "Ernie Els, Phil Mickelson can't grasp U.S. Open win with Tiger Woods struggling at Pebble Beach". Daily News. New York. 21 June 2010. Retrieved 21 June 2010. 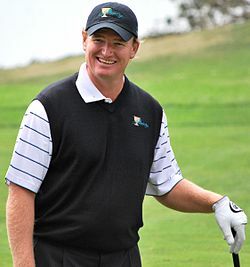 ^ "Ernie Els comes out on top in South African Open". BBC Sport. 19 December 2010. Archived from the original on 22 December 2010. Retrieved 19 December 2010. ^ "Ernie Els – Advanced Statistics". Golfrankingstats.com. Retrieved 22 July 2012. ^ Dolch, Craig (22 March 2012). "Putts Elude Els, and So Could Masters". The New York Times. ^ DiMeglio, Steve (23 July 2012). "Shocking finish: Ernie Els rallies to win British Open". USA Today. Retrieved 23 July 2012. ^ "Ernie Els wins British Open after late Scott collapse". The Times of India. Archived from the original on 23 July 2012. Retrieved 23 July 2012. ^ "Ernie Els rallies to win Open". ESPN. 24 July 2012. Retrieved 29 March 2013. ^ Kay, Emily (23 July 2012). "Ernie Els' 2012 British Open Win Reignites Demands To Ban Long Putters". SB Nation. ^ "Ernie Els returns to winning ways". PGA European Tour. 23 June 2013. Retrieved 25 June 2013. ^ "Ernie Els – Career Summary". PGA Tour. Retrieved 13 April 2016. ^ "Seeing the Bigger Picture". Ernie Els. 12 May 2014. Retrieved 15 May 2014. ^ Huggan, John (5 February 2016). "With new putting grip, Ernie Els feels reborn". Golf Digest. ^ Harig, Bob (7 April 2016). "Ernie Els 6-putts from within 3 feet for a record 9 on first hole at Masters". ESPN. ^ "Ernie's Masters Review". ErnieEls.com. 11 April 2016. ^ "Durrat Al Bahrain". Archived from the original on 29 August 2009. ^ Davies, David (13 October 2004). "Els ready to play hardball with US Tour". The Guardian. Retrieved 10 April 2017. ^ "Liezl Els Committed to Autism Awareness". PGA Tour Charities. 11 March 2010. Archived from the original on 14 March 2010. Retrieved 16 March 2010. ^ "Els seeks to help autism research after disclosing son has disorder". ESPN. Associated Press. 8 March 2008. Retrieved 14 June 2013. ^ "Kimberley Golf Club History". Kimberley Golf Club. Retrieved 20 June 2014.